Impacts of strategies that target insecticides to humans or animals can be rationalized in terms of biological coverage of blood resources, quantified as proportional coverage of all blood resources mosquito vectors utilize. Here, this concept is adapted to enable impact prediction for diverse vector control strategies based on measurements of utilization rate s for any definable, targetable resource subset, even if that overall resource is not quantifiable. While antiparasitic drugs and vaccines will be essential to the final stages of malaria elimination, their effectiveness as transmission control interventions will rely heavily upon unprecedented levels of vector control in highly endemic settings[1–4]. It will not be possible to eliminate malaria transmission from most of the tropics without developing scalable vector control intervention options which complement long-lasting insecticidal nets (LLINs) and indoor residual spraying (IRS) by targeting adult mosquitoes when they use resources other than human blood indoors, and indoor resting sites[5–9]. Mosquitoes usually also exploit non-human blood and human blood sources outdoors, as well as sugar, outdoor resting sites, oviposition sites, and mating sites, so all of these other biological and environmental resources represent alternative targets for vector control interventions. Faced with such an array of resource target options, the challenge is to define exactly which of these intervention targets are optimal in each of the diverse vectorial systems that exist, and to classify these settings into limited numbers of distinct categories where specific intervention combinations maximize impact. Recent analyses indicate that the impact of vector control measures targeting the blood hosts upon which mosquitoes depend can be rationalized in terms of measurements of the biological coverage of all available blood sources that is achieved, rather than merely high demographic coverage of a targeted subset, such as humans while asleep indoors[9, 11]. Blood resources are perhaps the best understood, and most readily quantified, of all the resources used by mosquitoes that could potentially be targeted with vector control measures. However, many established or emerging vector control strategies only target a specific subset of the resource that can be readily identified and treated in the field. Examples include targeting insecticides to indoor resting sites only with IRS, and artificially introduced resting sites[13–17] or sugar baits[18–20]. Furthermore, the other available forms of these resources that cannot be targeted with insecticides but compete with these subsets for the attentions of mosquitoes, such as naturally occurring sugar sources or outdoor resting sites[22, 23], are often impossible to identify or quantify. It is therefore not possible to estimate biological coverage as a fraction of all available forms of that resource. Here, the concept of biological coverage is extended beyond blood resources, and adapted to enable impact prediction for more diverse vector control strategies, based on direct measurements of coverage and utilization rates for definable, targetable subsets of less readily quantified resources that are equally important to mosquito survival, and therefore equally valid as potential targets for vector control interventions. All symbols used are listed and defined in Table 1. Rate at which the mosquito population utilizes a defined, entomologically surveyed sample (z) of livestock (l) blood resources (v l,z ), expressed as the number of utilization attempt events per night. 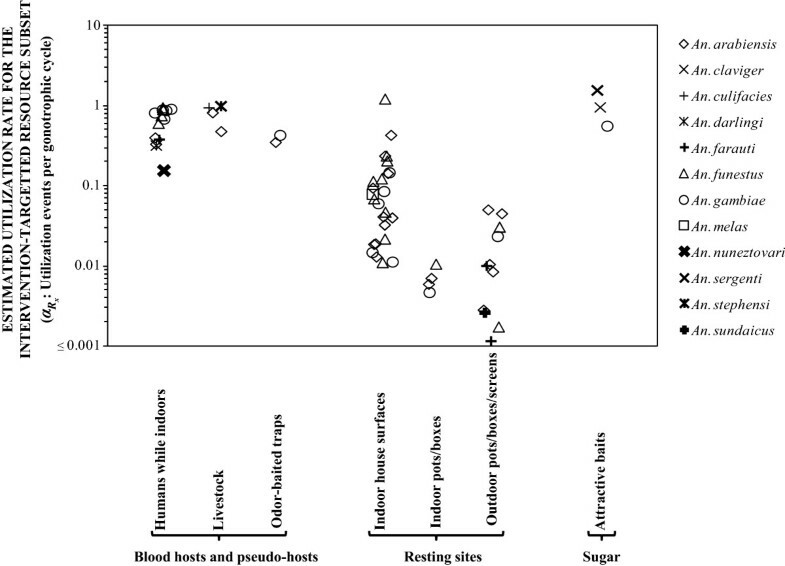 Proportion of human (h) blood (v) host exposure to mosquito bites that occurs indoors (i) in the absence of any protective intervention[11, 24, 26, 30, 32–38]. 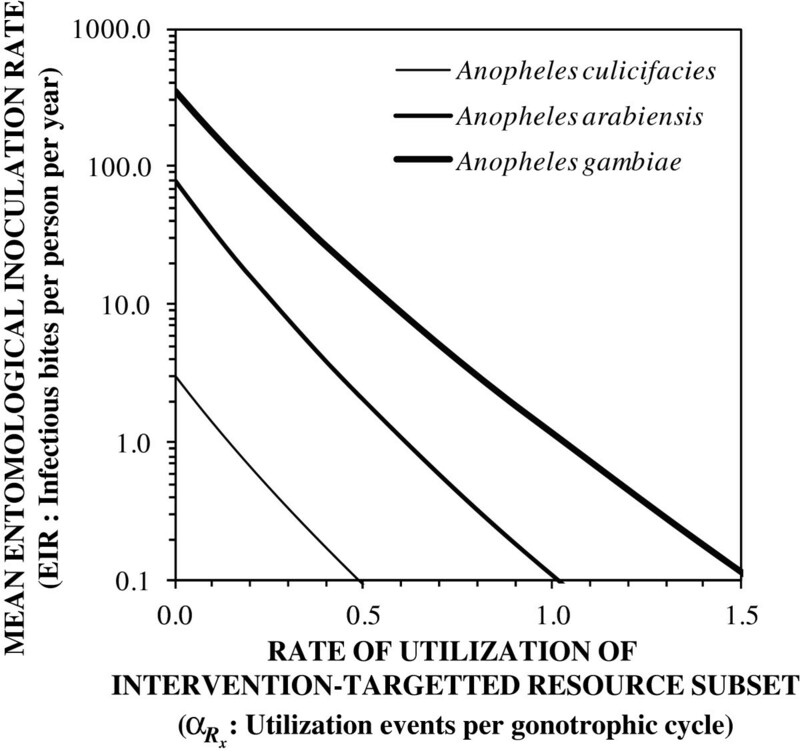 The total availability of all intervention-covered (c) forms of a targetable subset (x) of given resource (R which may be specified as blood (v), resting sites (r), sugar (s) or any other resource mosquitoes use) during the subset of times (y) when it can be effectively protected by that intervention, defined as the per night rate at which individual mosquitoes encounter and attempt to utilize the covered forms of that subset at times when it is effectively covered with that intervention. The total availability of an entomologically surveyed sample (z) of a targetable subset (x) of given resource (R which may be specified as blood (v), resting sites (r), sugar (s) or any other resource mosquitoes use), defined as the per night rate at which individual mosquitoes encounter and attempt to utilize it. where the total attack availabilities of the all hosts (A), and covered hosts at times and places when they are actually protected (A p ), are defined kinetically[25, 42] as the rates per night at which an individual host-seeking mosquito respectively encounters and attacks either all hosts or all hosts that are protected at the time of the encounter and attack events. where C v is the proportion of all mosquito attacks upon real (live vertebrate hosts) or perceived (artificial odor-baited traps, sometimes referred to as pseudo-hosts) blood resources to which effective coverage with a vector control intervention applies at that time and place, v is the total rate at which individual mosquitoes encounter and attack all hosts and pseudo hosts, and v c is the total rate at which individual mosquitoes encounter and attack all hosts and pseudo hosts at times and places when they are effectively covered with a vector control intervention. It is therefore not necessary to know the proportion of that total resource which the targeted subset represents, or the coverage (C R ) or utilization rate (α R ) for all available forms of a resource. Impact can be predicted directly so long as the coverage of the targeted subset itself C R x , y , and utilization rates for that subset under conditions that enable the intervention to protect it against safe utilization by the mosquito α R x , y , can be measured. This approach to predicting the survival probability assumes that utilization attempt events are randomly, and independently, distributed across all resource units and mosquitoes. Specifically, the number of times one mosquito utilizes a resource (or resource subset) in one gonotrophic cycle is assumed to be a non-negative integer valued random variable (0, 1, 2, 3…) since the mosquito may not necessarily use the resource or, alternatively, may access it multiple times. Hence, the utilization rate of these resources should be understood as an expected value depending on random events that may be expressed as a mean. This is clearly not the case in relation to obligate utilization of blood from one of all available blood resources (R = v). Each mosquito must utilize one of these available resources to complete the gonotrophic cycle, so complete coverage of all blood resources (C R = 1) that are utilized at a mean rate of once per gonotrophic cycle (α R = 1) with an insecticide which induces comprehensive fatality μ R c = 1 would deterministically result in reduction of survival probability to zero P α R , c = 1 - μ R c α R C R = 0 , rather than merely reduced to the minor proportion of mosquitoes that are inaccurately assumed by Equation 16 to have completed a gonotrophic cycle without taking any bloodmeal. However, for a covered subset of a resource (Equation 17), rather than for all available forms of that resource (Equation 16), it is realistic to assume that the number of utilization attempt events per gonotrophic cycle is a random variable for individual mosquitoes and utilization rates per gonotrophic cycle are expected values (expressed as a mean), even for obligate blood resource utilization behaviours. Note that the emergence and mean longevity terms cancel each other out so that estimates of these parameters are not required to estimate the relative rate of utilization of a resource compared with blood, as described below. where R x,z /R x is the proportion of all available forms of the targeted non-blood resource subset that was surveyed entomologically to measure the rate per night at which the entire mosquito population attempts to utilize it m R x , z , where N h,z /N h and N l,z /N l are the proportions of all humans or livestock that were respectively surveyed to measure the rate at which mosquitoes attempted to utilize their blood, and where Q v h and Q v l are the proportions of bloodmeals the vector population obtains from all available humans and livestock, respectively. Studies, or sets of studies, were identified which presented sufficient parameter estimate data for utilization rates of specific, intervention-targetable resource subsets to be calculated for specific malaria vector species in specific, distinct locations. In addition to the authors’ archives of literature and unpublished data, the Pubmed database was also queried with the search term ‘Anopheles AND ((pyrethrum spray OR aspirator) OR (insecticide AND (cattle OR livestock)) OR odour-baited OR sugar)’. For utilization of livestock blood and sugar, consideration was limited to studies in settings where trials of insecticide-treated livestock or sugar baits, respectively, have been either implemented or specifically suggested. To avoid cluttering of the second figure presented in the Results section, consideration of studies enabling estimation of indoor resting site utilization was restricted to recent unpublished studies of our own and those published in the last decade. Where results for a species complex or group were reported, these are attributed to the most common sibling species identified in that population. Figure 1 illustrates how the impact of a vector control intervention with a mosquito-toxic active ingredient depends on the utilization rate of the resource subset to which it is targeted, and on the pre-existing level of transmission mediated by the vector. Utilization rates exceeding, or at least approaching, one event per gonotrophic cycle are required to achieve useful reductions of intense, saturating transmission[4, 58] mediated by human-feeding mosquitoes such as Anopheles arabiensis and Anopheles gambiae. Less efficient vectors that predominantly feed upon animals, such as Anopheles culicifacies, cause far lower levels of transmission and morbidity burden that can respond more sensitively to effective transmission control because baseline exposure levels are not sufficient to saturate the human population with parasite infections[24, 58–61]. Very valuable impact upon transmission by such zoophagic mosquitoes may even be achieved by targeting resource subsets that are used as rarely as once every three feeding cycles because most malaria is transmitted by mosquitoes that are at least four gonotrophic cycles old[31, 54]. However, unless a resource subset is used at least once in every five gonotrophic cycles, it is unlikely to be a useful target for suppressing mosquito survival and population density through vector control, even for weak zoophagic vectors that rarely feed upon humans and mediate modest, manageable levels of transmission. The predicted relationship between the impact of vector control upon malaria transmission and the rate at which mosquitoes utilize the resource subset targeted by the intervention α R x . Anopheles epiroticus, An. arabiensis, and An. gambiae were chosen as examples of vector species that feed primarily upon animals, on both humans and animals, or primarily upon humans. Zero coverage of the human blood resource with LLINs C v h = 0 and high biological coverage of the resource subset which is targeted with an intervention C R x = 0.8 that induces high mortality among mosquitoes that utilize covered forms of that resource μ R c = 0.8 were assumed. Apart from the adaptation of the original formulation to capture intervention impact upon vector survival as a generally applicable function of target resource subset coverage and utilization rate (Equation 15 to 17), all predictions were made by parameterizing and executing deterministic models of malaria transmission and control, exactly as previously described[26, 51, 62]. Figure 2 illustrates the range of utilization rate estimates that could be extracted from the literature for a diversity of resource subsets used by mosquitoes. The predictions of Figure 1, and the generally high utilization rates of human blood while people are indoors (Figure 2), are approximately consistent with the documented impacts of LLINs upon malaria transmission. It is also notable that the lowest estimates for utilization of human blood indoors (Figure 2) are for An. arabiensis, Anopheles farauti, Anopheles darlingi, and Anopheles nuneztovari, all of which have been known to persist and dominate residual transmission systems following scale-up of LLINs or IRS[6–8, 33]. Insecticide-treated livestock also appear to be as promising a target for zoophagic vectors as LLINs are for anthropophagic (predominantly human-feeding) vectors, and the utilization rates estimated for Anopheles culifacies and Anopheles stephensi are consistent (Figure 2) with the proven impact of this approach upon malaria transmission by these species. Odour-baited traps act as pseudo-hosts by mimicking, and even surpassing, the taxis stimuli of normal blood sources for mosquitoes, luring them to fatal trap devices or insecticide-treated surfaces. While these can achieve useful utilization rates if their attractiveness and positioning can be optimized, these estimates are somewhat lower than for insecticidal nets and livestock treatments directed at the best-matched vector species (Figure 2) because these devices must compete with natural hosts that, therefore, constitute an inevitable gap in biological coverage. Estimated utilization rates for a variety of blood, resting site and sugar resource subsets α R x based on existing field data. See Additional file1 for details of literature, parameter values and equations used to calculate the estimates presented. Apart from blood, the other important nutrition source that facilitates mosquito survival and malaria transmission is plant-derived sugar[21, 65, 66]. Estimated minimum utilization rates for dye-labelled sugar baits by Anopheles claviger, Anopheles sergenti, and An. gambiae, in three distinct settings appear to be at least comparable with those for utilization of human blood indoors by very anthropophagic vectors, and for utilization of animal blood by zoophagic vectors (Figure 2). The impressive impacts upon all three of these vector populations that have been achieved by adding insecticides to such sugar baits[18–20] are therefore consistent with the predictions outlined in Figure 1, as well as other recent modelling analyses. Given the widespread dependence of mosquitoes upon sugar[21, 65, 66], many important vector populations probably use it at similarly high rates, especially when infected with malaria parasites. Mosquitoes should therefore be at least as amenable to control with this approach as anthropophagic vectors are to LLINs, and as zoophagic vectors are to insecticide-treated livestock. Utilization rate estimates for indoor resting sites (Figure 2) are generally lower than that required to explain (Figure 1) the often massive impact of IRS and insecticidal wall linings on many target vector species. However, this is not entirely surprising because even the best techniques for capturing mosquitoes resting indoors, such as pyrethrum spray catch and backpack aspirators, are known to consistently under-sample them. Nevertheless, the estimates of resting site utilization presented in Figure 2 are clearly useful for comparison of different potential resting site targets, confirming that comprehensive spraying or lining of entire rooms and houses is probably superior to targeted treatment of pots, boxes (some of which were baited with host odours) or screening barriers, all of which were placed indoors for endophilic vectors or outdoors for exophilic ones[13–17]. However, perhaps the most important observation in relation to these estimates of resting site subset utilization rates is that they rely on upon quite complicated calculations requiring at least five distinct input parameters (Equations 25a, 25b and 30), many of which have to be assumed based on best guesses or literature values from a different setting (Additional file1). In fact, none of the estimates presented in Figure 2 are based entirely upon local estimates for all the input parameters (Additional file1), and are therefore not entirely independent of each other or representative of the full range of values for any of the vector species described. Estimating coverage and utilization of a resource subset primarily depends upon defining it in a quantifiable manner that can be readily surveyed and targeted, or artificially created in the field. The most obvious and familiar examples are the human populations targeted for universal coverage with LLINs to protect the blood resource they represent to mosquitoes[28, 43, 71]. While wild animals are difficult to survey or deliver interventions to, livestock represent blood resources that can be readily quantified and targeted with interventions. It is even easier to track numbers and functionality of artificial odour-baited traps, which mimic and compete with natural blood sources for the attentions of host-seeking mosquitoes, so their potential impact can also be predicted as a function of biological coverage of all available hosts and pseudo-hosts. The subset of all resting sites represented by the inner surfaces of human dwellings (walls, ceilings and even furniture) are the defined target for IRS[12, 71], as well as insecticide-treated tents, shelters[73, 74], and wall linings, so coverage can be quantified as the proportion of residential structures treated. On the other hand, artificially introduced pots, boxes, curtains, linings or screening barriers compete with natural resting sites[13–17]. Mosquitoes can be captured relatively efficiently on these well-defined, convenient, standardized surfaces, so it has been suggested that these could also be treated with toxic insecticides to improve control efficiency[13–17]. While it remains difficult to consistently identify and define sugar, oviposition site or mating site resources, recent progress with observational[75, 76], trapping, tracing and labelling[18–20, 22, 23, 78–81] methods for mosquitoes is encouraging. Comparing the range of utilization rates described in Figure 2 with the predictions of potential impact illustrated in Figure 1 confirms that, despite their known limitations[52, 82], existing entomological field methods may be very useful for designing and evaluating a wide diversity of vector control products. Both blood and sugar meals can be readily identified using a variety of naturally-occurring markers and artificially added tracers[18–20, 22, 23, 78–81], thus enabling very direct, robust measurement of label uptake as a function of time or age. Utilization rates can therefore be estimated directly for subsets of these naturally occurring resources (Equations 26, 27, and 29) or indirectly for artificially introduced subsets such as odour-baited traps (Equation 28). Utilization rates for resting site subsets (Equation 30), or indeed any other non-blood resource (Equation 25a and 25b), can also be estimated indirectly by calibrating against measurable utilization rates for quantifiable, preferred blood sources. However, the complexity of these models, and their reliance upon local measurements of several entomological input parameters, all of which have limited precision and accuracy, may well limit broader application of this approach beyond the crude application to existing data presented in Figure 2. Recent attempts to rejuvenate and improve existing entomological survey methodology for detecting resource utilization attempt events with electrified grids[84–86], sticky traps[77, 87], mechanized aspirators, and high resolution cameras[75, 76], should enable improved sensitivity of utilization attempt event detection at surveyed samples of resource subset targets. However, while such technical advances may well address the inaccuracies of attempts to estimate utilization rates for subsets of resting sites or other non-nutritional resources by improving event detection sensitivity, they are unlikely to improve their precision because considerable uncertainty arises from the need for relatively complex models (Equations 25a, 25b and 30) that require correspondingly numerous measurements of input parameters. Fortunately, a wide range of more sensitive chemical, biochemical, genetic and biological markers, that could be applied to labelling mosquitoes when they use these other resources, are now available but these remain to be fully exploited. In fact, field studies using artificial tracers to label of both mosquitoes feeding upon sugar[18–20] and sand flies feeding upon rodent blood[88, 89], in which addition of insecticide removed almost all labelled insects from these vector populations, clearly demonstrate the validity of this strategy as a means to estimate biological coverage or utilization rates. The major advantage of labelling mosquitoes when they utilize a resource subset, rather than trapping or observing them, is that the measured proportions of marked insects can be readily analyzed with robust off-the-shelf statistical methods for binary outcomes, and are relatively precise because they have a nominator and denominator which both vary in proportion to population size or event detection sensitivity. The largest caveat to this approach is that essentially all targeted forms of that resource must be labelled on geographic scales large enough to negate the effect that mosquito dispersal has upon measurements of label uptake: immigration of unlabelled mosquitoes into the study area will increase the denominator while emigration will reduce the nominator, so that true local utilization rates will be systematically underestimated[52, 90, 91]. However, this phenomenon could also be exploited to great advantage if multiple distinct labels for various treatment arms were used to measure, and correct for, the effects of mosquito upon impact distribution in large-scale trials of vector control interventions. The conceptual framework and entomological measurement priorities outlined here should be readily and directly applicable to almost any population of mosquitoes, vectors or other pest. It should therefore be possible to simultaneously tackle multiple vectors with integrated vector management programmes that prioritize interventions based on simultaneous, comparative field assessment of respective utilization rates for each potential target species. Recent demonstrations of the usefullness of dummy bait products containing appropriate labels but no insecticide[18–20, 88, 89] illustrate how cost-effective, robust measurements of utilization rates could be used to select and optimize available technologies for immediate use or new prototypes for development. The concept of biological coverage can be extended to enable prediction of intervention impact for diverse vector control strategies based on estimated utilization rates for any definable, targetable resource subset. Indeed the applicability of this approach has been demonstrated here using existing entomological measurement methods to rationalize the observed impacts of LLINs, insecticide-treated livestock, and attractive toxic sugar baits upon malaria vectors. The development of improved and diversified technologies for controlling transmission of malaria, as well as a diversity of other vector-borne pathogens, could therefore be accelerated, rationalized and streamlined based on field measurements of the rates at which mosquitoes utilize targetable biological resource subsets. While blood and sugar consumption can be readily quantified using existing methods for detecting natural markers or artificial tracers, improved techniques for labelling mosquitoes will be required to assess and optimize vector control measures which target them when they utilize resting, oviposition and mating sites. All mosquito species need sugar, resting sites, oviposition sites, and mating sites, as indeed do most arthropods of medical and veterinary importance. These resources are therefore important potential targets for the new or improved vector control methods that are clearly needed to eliminate malaria, and also a variety of other vector-borne pathogens. To enable comparative assessment of all potential resource subset targets, including sites which mosquitoes rest, oviposit or mate at, existing tracer technologies need be adapted to enable reliable, non-toxic, non-disruptive labelling of mosquitoes when they utilize these non-nutritional resource subset targets. We thank Dr. K Aultman and Dr. D Malone for discussions that stimulated and influenced the content of this manuscript. We thank Prof T A Smith for guidance on the probablistic basis of exponential decay models, and Dr. T R Burkot for critical comments on the manuscript, as well as providing population size data for Haleta. We are also grateful to three anonymous reviewers, whose comments had a substantive influence on the final interpretation and conclusions. This work was funded by the Bill & Melinda Gates Foundation (Award numbers 45114, 52644 and OPP1032350). GFK, AS, JEG, JS, and CJD developed the study hypotheses, contributed data for the analysis, and assisted in the revising the manuscript. GFK conceived the study, developed and applied the model and drafted the manuscript in consultation with the other authors. NC, SSK, and GC refined the mathematical formulation of the model. NC oversaw finalization of the manuscript. All authors read and approved the final manuscript.